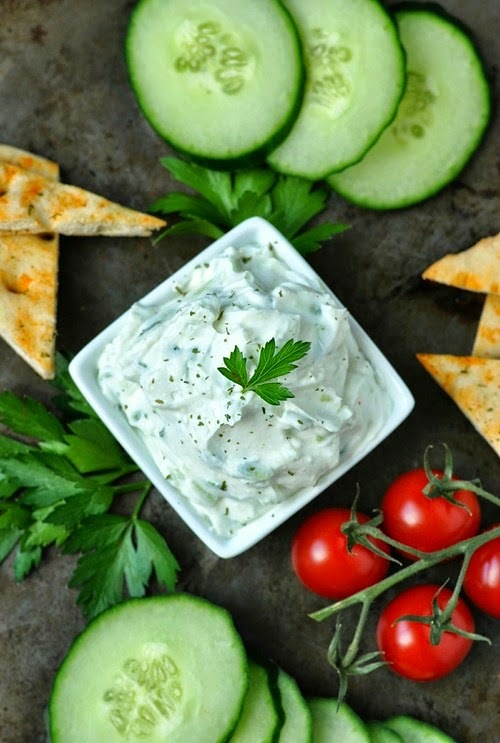 This Thick and Creamy Restaurant-Style Tzatziki Dip makes a great sauce, dip, or spread. Make extra because you’ll want to put it on everything! 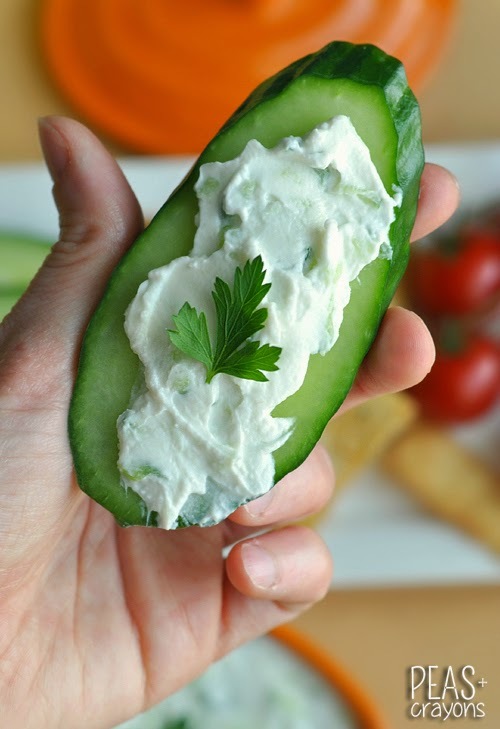 This easy peasy yogurt dip features a blend of Greek yogurt, cucumber, lemon, and garlic. Finish it off with a pinch of salt and a sprinkling of your favorite herbs as a garnish and get ready to faceplant! It’s great as a standalone appetizer served with fresh veggies and pita but is also an amazing addition to your favorite mediterranean dish. We love it as a spread for Chicken Gyros, dolloped on Greek Quinoa Bowls, and as a totally dunkable dip for my Healthy Mediterranean Potato Skins. 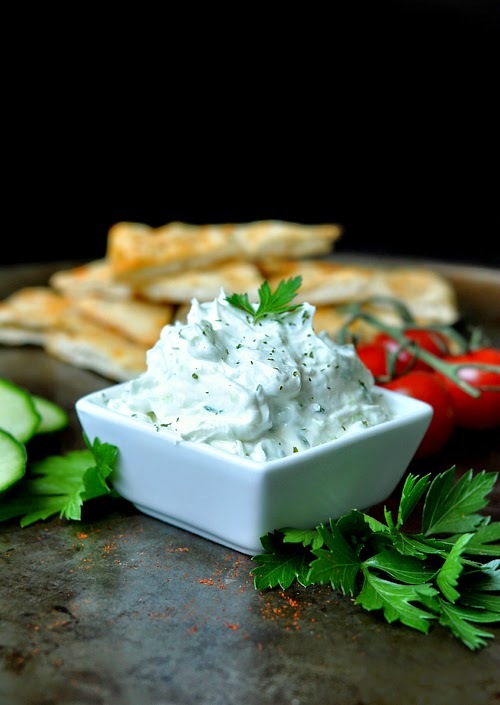 Grab your favorite brand of yogurt and let’s make the creamiest, tastiest Tzatziki dip ever! Those of you that have been with me for a while know I’m accustomed to a semi-nomadic lifestyle… For a while Paul and I actually moved at least once a year; sometimes twice! For some this may seem daunting, but for someone as situationally fickle as I am, it’s a dream. I bore of my surroundings easily and LOVE moving. We’ve been in North Carolina for almost four years and these past few months the walls have officially closed in. I need a change of pace like Madison the cat needs to be shaved like a lion. It’s basically a necessity at this point. There’s always a silver lining, of course, and there are some pretty delicious eats around here! One particular restaurant makes the freaking BEST tzatziki dip I’ve ever had. It’s not your typical cucumber sauce either. This stuff is so impossibly thick that you could hold the bowl upside down over the table and it wouldn’t budge. It’s essentially the Dairy Queen Blizzard of tzatziki dip. YES. I’ve been trying to re-create it at home for ages now and I finally figured out what I’ve been doing wrong: fat-free yogurt. I don’t typically use fat-free anything in my kitchen but yogurt typically gets the green light. I’m now, however, a full believer that a little bit of milk-fat in your yogurt can make a huge difference in the flavor of a dip. We can’t get enough of this super tasty dip! It works great as a dip, spread, or sauce for anything your heart desires! 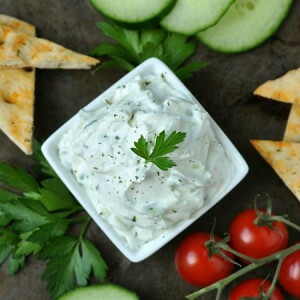 This Thick and Creamy Restaurant-Style Tzatziki Dip makes a great sauce, dip, or spread. Make extra because you'll want to put it on everything! Grab an English cucumber (the skin on these is extra tasty and the seeds are minimal) and, using a box grater or food processor, shred the cucumber until you have about 1/4 cup packed in your measuring cup. Press out the extra moisture with a paper towel and feel free to grab a knife and chop the shreds into smaller pieces to help it blend seamlessly into your yogurt. Next mix the 'gurt and the cuke with your salt and garlic powder and get ready to thicken! To make impossibly-thick yogurt all you have to do is strain it! My favorite method is pretty no-fuss, no-muss and involves topping a large bowl [or a pot!] with a mesh strainer and several layers of cheesecloth. Typically the cheesecloth comes in a giant roll so just fold it over itself a bunch of times, slap it in the sieve, and pour in your yogurt. To make it air-tight and keep things fresh, wrap the top of the bowl with plastic wrap and place in your refrigerator for a few hours. Though it will begin to thicken within 2-3 hours I will typically leave mine in overnight to achieve cream-cheeseesque consistency. Pretend that's a word. Once it's ready re-season to taste if needed and garnish however you'd like! I grabbed a little parsley from the garden to green it up a bit! If you're adding any of the extras I listed above, you can add the fresh herbs and garlic at any time, but if you're using lemon juice and/or olive oil, I would add the olive oil at the very end, drizzled over the final product and add the lemon juice before straining so it doesn't dilute the dip. You can also serve the dip up with lemon wedges on the side as an edible garnish or add a little zest to the top of the dip along with a sprinkling of fresh or dried herbs. Customize to your heart's content! I make it with whatever is on hand in my kitchen/pantry that day so it's a little different each time; however, I will forever be straining my own full-fat yogurt to make it from here on out. It's just so flipping rich and tasty and lacks the dry mouthfeel that plain low-fat and fat-free yogurts have. This was a ridiculously long recipe description for a ridiculously simple dip, but hopefully now you're armed with all the info you need to make a rockin' tzatziki dip! Recipe yields 1 heaping cup of dip. The recipe above is a copy-cat of my local Greek restaurant and I quickly learned that they have a small obsession with garlic powder. If you happen to have the fresh stuff on hand and prefer it, go for it! Depending on what's in my kitchen on a given day, the tasty extras from the list above usually find their way into my Tzatziki sauces and dips. If you get a chance to try this Thick and Creamy Restaurant-Style Tzatziki Dip, let me know! You can leave me a comment here (LOVE checking those daily!) or tag @PEASandCRAYONS on Instagram so I can happy dance over your creations. I can’t wait to see what you whip up! Scoop it up with fluffy pita bread, crispy pita chips, crisp veggies. 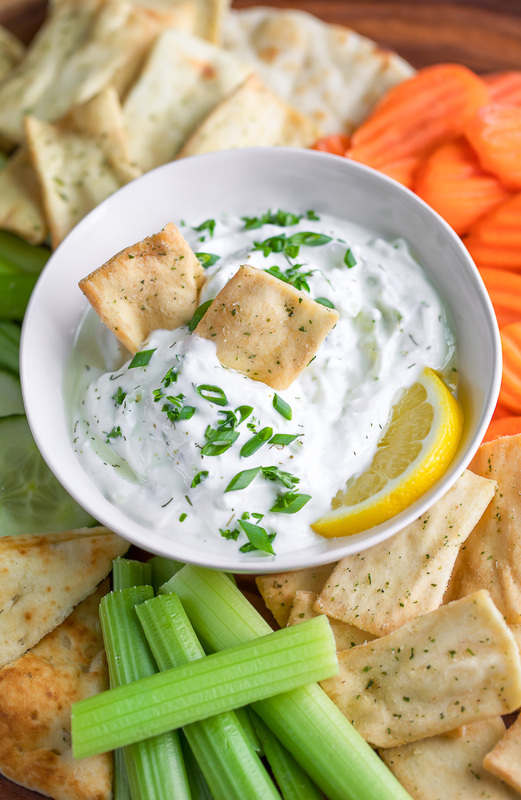 We love this Creamy Restaurant-Style Tzatziki Dip! I can’t imagine moving so often. I’m sort of a homebody. But, I can totally imagine eating this dip – like every day on everything! Thanks for figuring out the recipe so I don’t have to! It for sure has its ups and downs! Right now I’m even kind of itching to move again haha! What a delicious looking dip and soooo easy! I don’t know why I have never tried to make my own tzatziki before but that’s going to change. Thanks for the awesome recipe. Yay!!! So glad you enjoyed it Virginia! Hope your 2019 is going amazing!! Ooh haven’t tried that place! Our Greek Restaurant in New Bern, NC was this tiny hole in the wall pizza and sandwich shop that was Greek owned and had insanely amazing Tzatziki, Baklava, and grape leaves too! I miss it so! I could eat tzatziki by the bowlful from our local Greek restaurant! It is so much cheaper to just make it at home. Thanks for a great recipe! This has become my new go-to snack. It’s fantastic and I feel so good after eating it! It’s so insanely thick and creamy – love it so! I love mango and avocado and that soup looks fantastic! I am completely in agreement with your seventy year old food science teacher. Now bring on the Tzatziki Dip. I love dips, espcially in the warmer weathers. This one I can make without messing it up. Well we have a Noosa here, and a Noosa brand of yogurt. So true about the fat content making the difference- After switching to full fat from 0%, it made the 0% greek yogurt taste like water. Sour water. I’m with you on the moving thing, we moved 4 times in 2 years, and I’m itching to go again! Love a good tzatziki sauce and totally agree with you on the full fat yogurt, makes all the difference in the world! Holy yum! I’ve never thought about straining my yoghurt before. I’m the same with Greek yoghurt, avos, olive oil, coconut oil I’m all for the health fats but with my yoghurt I always go fat free.